The wind has been battering the trees at the bottom of the garden for the last two days which is a pain in the rear as I use the nice tall trees to support the far end of my wire antenna, you can imagine the rest. I had been watching my Carolina Windom wire slap about until eventually it fell to the ground. In between a rain shower I decided to brave the gusts and managed to get a next piece of rope up into the tree and wound the wire back up in the air. It looked good, nice and straight with an extra 10 feet of height after a lucky throw that I pulled off earlier. I ended the evening the way radio amateurs like best as I made a very nice QSO on 17 Meters into Tokyo Japan with Yoshi - JA1OJJ. JA1OJJ signal was a 5/8 solid copy on my Ft1000mp MKV, Yoshi give me a 5/6 report on the tree swaying Carolina Windom (CW-80). When I awoke this morning the CW-80 was still in the air but not for long! The dreaded wind took it out again sometime today, as you can see in the picture above I wont be active on 17 Meters tonight. 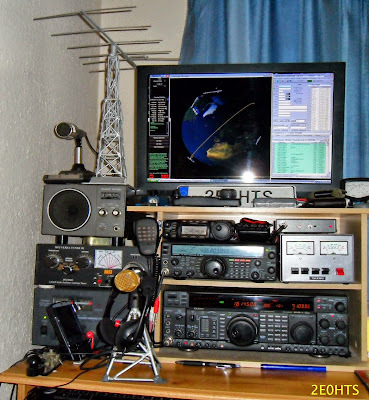 Since moving in to the new QTH I have been regularly tweaking my amateur radio set up and testing out various equipment configurations. I have now finally got my station working effectively and have settled for a lay out that I can comfortably work with, which can be seen pictured below. 22” Monitor and Dual Core 3800, 2Gig Ram - P.C, Running XP Pro. I also enjoy making models in my spare time usually out of metal. In my shack you can see a couple of models I made for my collection. Supporting my HEIL Microphone, I made a mast like structure with a PTT switch fitted neatly to the side. I also have made a few mini towers that have manually rotating miniature scale Yagi beams on top. My favorite model radio mast and antenna can be seen on top of my SP – 102 Loud Speaker. My other model tower is up at the holiday Shack along with the rest of my equipment. Well that’s all for now, I look forward to working some of you somewhere on the bands from my fully tried and tested ham radio shack! Good DX & 73 thanks for the visit. Earlier this afternoon whilst receiving NOAA weather images on my FT-847, I was listening to 17m on my FT-1000MKV mp hooked up to the Carolina windom, when I heard Mega - JA3EGZ. I listened for a while as he worked a nice steady flow of Stations located across the globe. After about 30 minutes once the initial pile up had diminished I heard him with a signal strength of 5/7 calling "QRZ." It was then when I gave just one Call and to my great satisfaction was heard by Mega - JA3EGZ. JA3EGZ gave me a 5/5 signal report during our qso, I am very pleased with the CW-80 antennas performance on 17m as well as from 80m right through to 10m.The Carolina Windom is a great wire antenna when installed well, with the 6 band Vertical as a second choice, this new QTH is working well on the HF bands and seems to have a great path to JA.